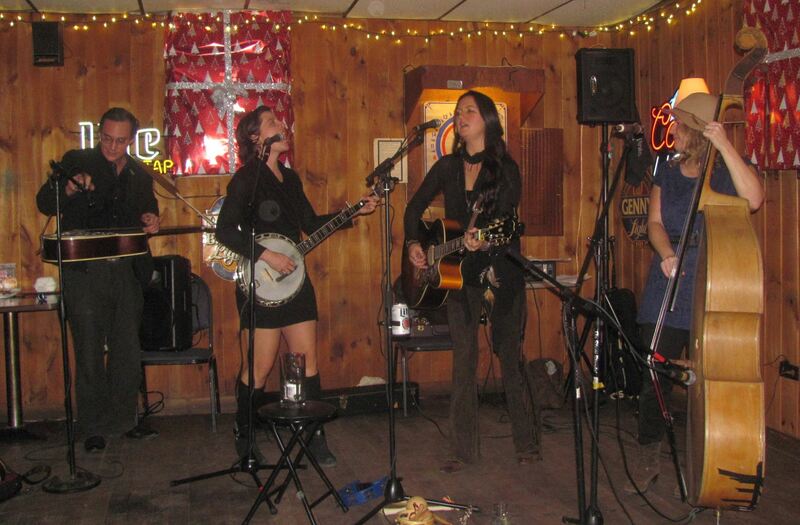 Members of Sassafras (top, from right) Jillian Hannigan, Jessica Illuzzi, and Channing Lynn were joined during several songs at a recent gig at The Blogg in Tunkhannock by guest performer Merl Johnson from Virginia. The corner in which the band played will soon become a stage, one of many renovations underway at The Blogg. The girls (above) mesmerized the audience with an updated repertoire that blends folk and bluegrass with many other flavors. I had the pleasure of seeing members of Sassafras perform twice recently, but one night in particular was very special. 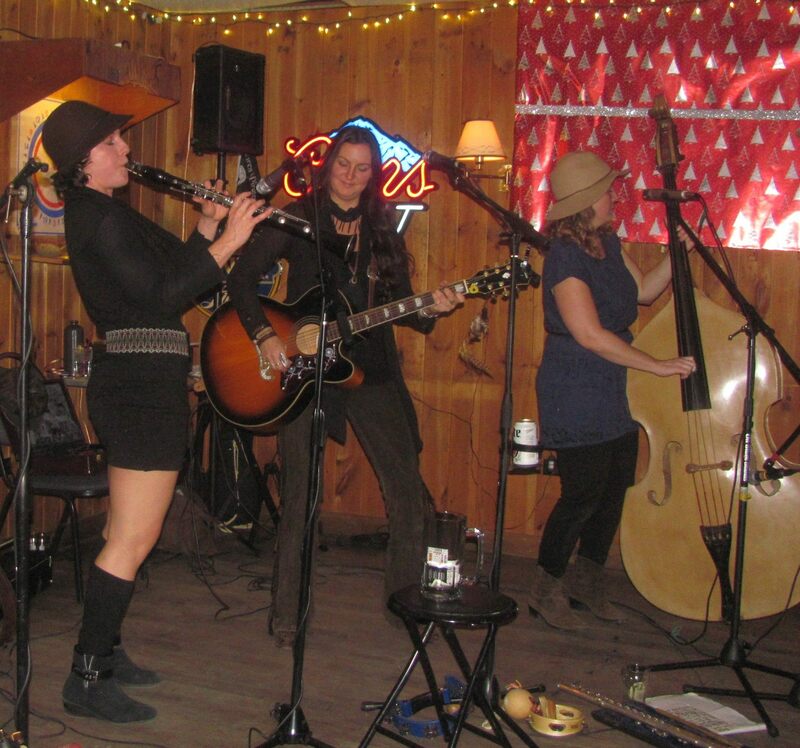 A trio of talented women, who enjoyed early popularity with a repertoire of fairly traditional bluegrass and mountain folk music, demonstrated on Dec. 3 that they are exploring new horizons and taking their music in new directions. Their venue for their performance – The Blogg – is also undergoing changes that seem poised to help catapult Tunkhannock into a new era as a cultural hub. Though Wyoming County resident Jessica Illuzzi is most often at the core of the female ensemble, regular member Jillian Hannigan is largely regarded as the mother hen role of this fascinating brood of gypsy chicks. Jillian’s sister Channing Lynn from Virginia joined the group during the past year, replacing Christina Cox, who took a teaching job in Australia. Since Jillian is also a member of Hickory Project, a bluegrass band led by her husband Anthony that is achieving national popularity among their contemporaries, Jess has kept the Sassafras name alive by teaming up with other talented musicians at home and abroad. She opted to go on a cruise last year that introduced her to a bevy of new musicians and styles as she explored the Caribbean. Back home and rebuilding her performance schedule together with Channing, the girls provided a rare treat for a largely unsuspecting audience at the Blogg when Jillian arrived from her home in Wellsboro to give The Blogg customers the full Sassafras experience. They were joined at times by Merl Johnson, also from Virginia, who accompanied the women on several songs with his dobro guitar. “Holy Cow! Is that a Dobro?” a patron named Greg seated next to me asked. Greg related to me that he was preparing to leave from The Blogg earlier after having a couple beers, but just listening to Jess and Channing warm up made him realize that this was going to be a unique night not to be missed. Greg is fairly new to town, coming to Tunkhannock by way of the Baltimore area. He’s seen boom and bust many times in his life, and he’s exuberant about what he sees as an inevitable “explosion” in Tunkhannock’s cultural scene. As an employee at one of downtown’s two high-end eateries, he sees The Blogg and owner Carlos Pineda’s extensive renovation of the property as integral to the growth of arts and entertainment in Wyoming County. As Sassafras worked their way through a repertoire that sounded more cabaret-like than the previous performances at bluegrass festivals to which I’d grown accustomed, I observed the customers experiencing a true sense of awe. Many of them were simply there to eat, as the Blogg is building a great reputation for its new pub menu. Aesthetically, the casual diners must have felt that they’d hit the jackpot. With forks held halfway to their mouths, dinner patrons seemingly paralyzed with delight as the girls alternated between guitars, stand up bass, fiddles, clarinet and other instruments and segued effortlessly from one high-spirited romp to another. While there is still bluegrass and traditional folk at the core of their show, their repertoire is now interwoven with elements of jazz, world beats, and hauntingly soulful blues. The girls in Sassafras don’t hesitate to mingle directly with the audience while playing solos or joining them in the impromptu jigs that spontaneously erupt on the dance floor. They also prove themselves to be down to Earth and sociable between sets, an element that Greg noted was sadly lacking with a band that he’d seen there the previous week. The women of Sassafras share a unique fashion sense that might best be called “contemporary gypsy.” With Jess flanked by twin sisters and best friends who banter amusingly between songs, their ease with each other exudes a charm that warms over even the most staunch heavy metal or rap fan in the audience who arrives convinced that he or she does not like this kind of music. Perhaps, when you can’t put a specific label on an art form, the brain is unable to judge “good” or “bad” based on preconceived notions. You are left bewildered and your senses overwhelmed by what can only be described as pure talent and energy, both of which Sassafras possesses in great quantities. In part, I perceived the overall experience through Greg’s eyes – a view that only an outsider can provide. I have been drinking in that bar, formerly The Beagle Pub, for more than 30 years, and I certainly had my best time there ever that Thursday evening. Seeing the structural improvements already completed and underway, as well as the blueprints for the fully renovated establishment, I have to agree with Greg that the rise to prominence that The Blogg will experience with the continued booking of a wide variety of entertainment will make it a cultural hub and encourage creative competition among similar venues in town. Knowing as I do of other projects and improvements planned in the next year that will continue to build on the county seat’s growing reputation for arts, culture, and heritage, the next boom seems inevitable if not the most sustainable progress that the town has experienced in years. An “ah ha” moment at The Blogg that night led me to believe that Sassafras’s performance was somehow a milestone on a road to success from which all artists and businesses in Tunkhannock can benefit. For more information and to follow the progress at The Blogg, follow them on Facebook. To book Sassafras, call 570-240-0401.